Reducing Agent TP 1651 by Brüggemann is a formaldehyde-free reducing agent with high process robustness. It shows excellent performance for the emulsion polymerization of styrene acrylate based systems. It is used in the formulation of inks and decorative coatings. It is applied in solution at a concentration of 3-5% at reaction temperatures between 50-80°C. It can be used in redox systems in combination with all commonly used oxidizing agents (peroxides) over a pH range of 2-8. 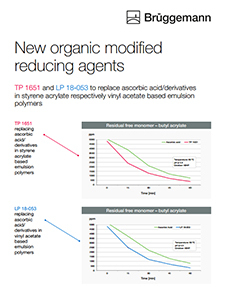 Reducing Agent TP 1651 offers good alkaline resistance, faster reaction, decreased VOC & residual monomer content, no discoloration & yellowing, and better filtration of emulsion polymer. Shelf life of this grade is at least 12 months when stored at 25°C.